Retired Judge Barbara Sattler with her dogs, Toby, whom she is holding, and Teddy, relax at home. She was inspired to write a book while taking a writing class at Pima Community College. The book cover for Sattler's book, which was released last month. You just know that after spending 16 years as a defense attorney and another 12 years on the bench, retired Pima County Superior Court Judge Barbara Sattler has some stories to tell. But when she sat down at her laptop last year, that isn't what poured out of her. Instead, Sattler wrote a fictional book about dogs and how they help a recently released convict learn about life and relationships. 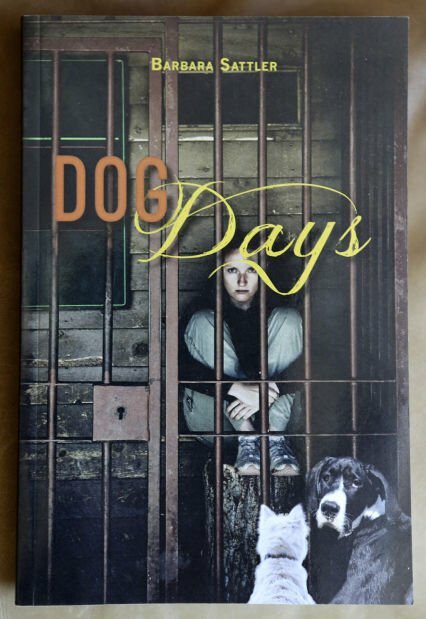 "Dog Days" was released last month on Amazon.com and Kindle. Sitting at her north-side home recently, Sattler said she's been an avid reader since her mother took her to the library at the age of 4. Fiction, nonfiction, it doesn't matter to her. Sometimes, while she was sitting on the bench she would sometimes think various aspects of a case were interesting enough to include in a book, but never gave writing books serious thought. Until, that is, she made a spur-of-the-moment decision to take a writing class through Pima Community College with a friend. One day, her professor handed the students pictures of a window looking over the ocean, Sattler said. Suddenly, Sattler was imagining a young woman in prison thinking about getting out. Since dogs are her other passion in life, it just made sense to write a story combining the two. Before too long, Sattler was writing about a woman named Kristin and an overweight beagle/corgi mix named Teddy and a black Labrador retriever named Samantha. "I really believe dogs do wonderful things for people," Sattler said. "They make you a better person." Just because a character in the book shares the name of a certain sitting judge, doesn't mean anything, Sattler said. Kristin and the other human characters in the book are composites of several people she knows. Not only does Sattler get fulfillment from writing, she loves the freedom of it. She doesn't have to set her alarm. She can take days off, and she doesn't feel the need to plot every moment. "When I write, I don't know what's going to happen," Sattler said. "My characters tell me what's going to happen." Sattler also didn't have a deadline. If she was feeling particularly motivated, she would try to finish a chapter in time for her writing classmates to critique it, but that wasn't always the case, Sattler said. Her husband, retired UA law professor Kenney Hegland, edited the entire book. Her classmates probably edited 75 percent of it, Sattler said. "I never wanted to give up, but there were times when I wondered if I was wasting my time because there are just so many wonderful books out there," Sattler said. She decided to publish the book herself because that's what new authors are doing nowadays, she said. She has no idea how well the book is being received. After all, she said with a laugh, no one is going to tell her they didn't like it. Still, Sattler is already three-quarters of the way through a second book. The new one is about a public defender who encounters an ethical dilemma in the middle of a murder trial. "I think in some ways it will be a better book because I'm becoming a better writer all of the time," Sattler said. All of the proceeds from the sale of "Dog Days" will be donated to the Transverse Myelitis Association, a nonprofit organization that helps people with rare neuroimmunologic disorders. In 2001, Sattler was diagnosed with a rare, serious neurological disease that left her partially paralyzed temporarily. Although she still has symptoms of the disease, Sattler said she feels compelled to donate the proceeds because she's been incredibly lucky in life.